A happy day as these Boys of the 2nd BB Company march in to attend the worship service preceding the 75th Anniversary Dinner. – BB picture. 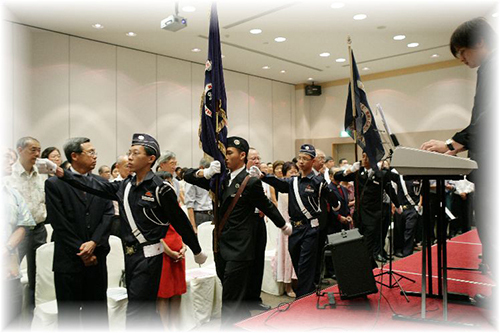 THE 2nd Boys’ Brigade Company celebrated its 75th Anniversary with a dinner on Sept 15, 2006 at the SAFRA Mount Faber. 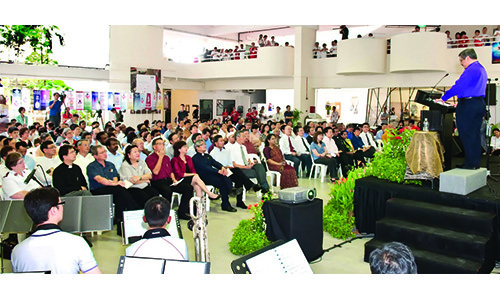 The 2nd Company, which started at Kampong Kapor Methodist Church (KKMC), is the oldest Methodist BB company in Singapore. It was formed in 1931. A worship service preceded the dinner. 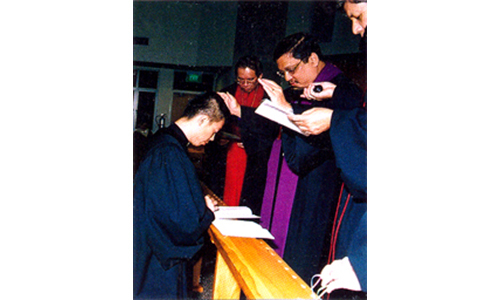 The Rev Philip Heng, a former BB Boy of the same company, gave a meaningful sermon entitled “Lest We Forget”. There were more than 430 guests present. Among them were Officers and Boys, Old Boys, former officers, former chaplains and former principals of Victoria School where the 2nd Coy now holds its weekly parades. Mr Tan Boon Chiang, Honorary President, BB in Singapore, stood in for our guest-of-honour, Mr Liau Nyuk Siong, Honorary Captain of the 2nd Coy, who was taken ill and could not attend the dinner. In appreciation of 25 years of partnership with Victoria School, the Rev Dr Kang Ho Soon, the Pastor-in-Charge of KKMC, presented 25 “Dendrobium the BB” orchid plants to the principal, Mr Low Eng Teong. The celebration was enhanced by the fact that the 2nd Coy had just won the Championship for the National BB Bible Quiz competition for the third year in a row (2004 to 2006) and thus was entitled to keep the Bishop Solomon’s Challenge Trophy. The dinner fellowship and reminiscences were delightful and heartwarming. The video clip brought back happy memories of the good old days. An African proverb says, “It takes a whole village to raise a child.” The BB movement provides an excellent community to raise our youth. Here, they find security and interested adults to help them realise their full potential. Each of the dinner guests went back with a beautiful 75th BB anniversary mug, an informational BB magazine and a heart filled with gratitude to God. 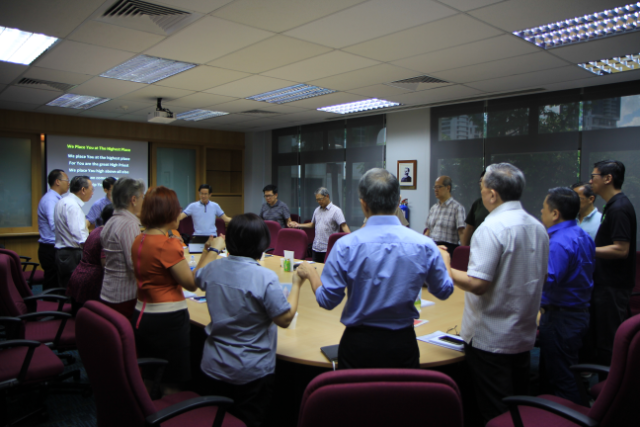 We thank Mr Sam Tan, Honorary Captain of the 2nd Coy and Honorary Vice-President of the BB, for chairing the event. 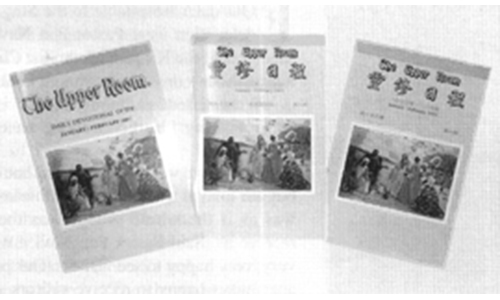 Darius Tan, who is currently studying at the Imperial College, London, is an Old Boy of the 2nd Company of The Boys’ Brigade. IS HIGH commitment the exception in our churches rather than the norm? Are our churches producing more consumers of religious goods and services rather than disciples who choose a life journey of following Jesus? And what are the congregational commitments and the leadership priorities of a disciple-making church? To address these and related issues the TRAC Board of Witness and Evangelism, together with the Intentional Disciple-making Network, is organising a one-day transformation conference with “Choose the Life! Choose the Church!” as its theme. • Bob Gilliam – President of T-NET International with ministries in 15 countries, and a church consultant with more than 1,000 church consultations completed. There will also be a Pre-Conference plenary session on the evening of Jan 5 with free admission for the public. 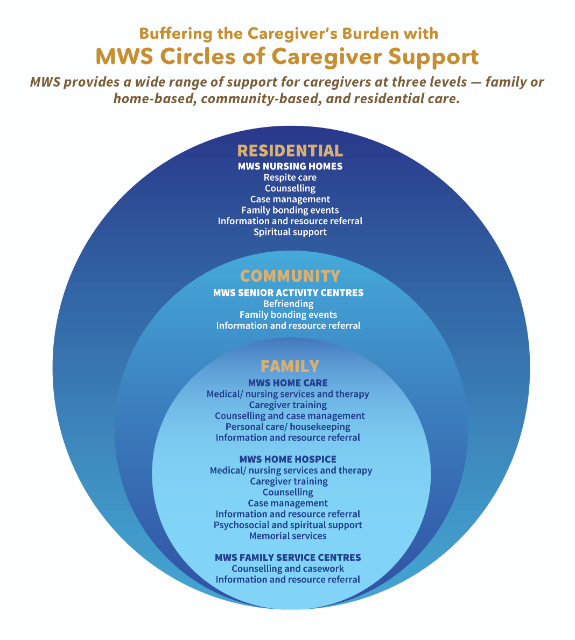 For more information and registration, email: ataygc@gmail.com or call MayAnne at 9190-9298.